Enjoy this quiet week, and take advantage of the moments of reflection on the New You in the New Year. When you make your way out of the house, we have some ideas for where you might go! Call (845) 202-7735 to make a reservation! 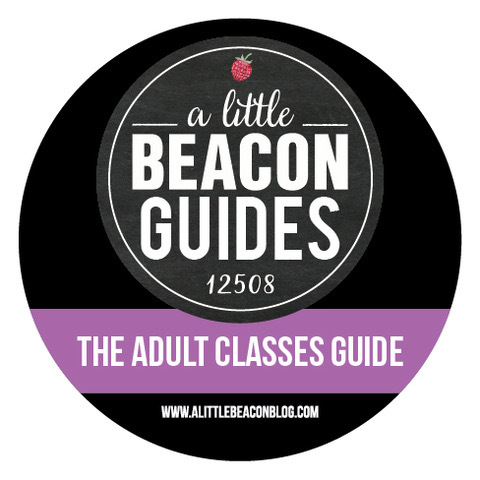 For a full list of upcoming classes, visit our Adult Classes Guide. 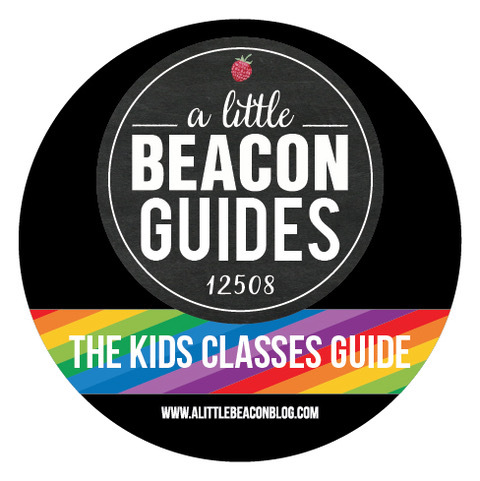 For a full list of upcoming classes, visit our Kids Classes Guide. 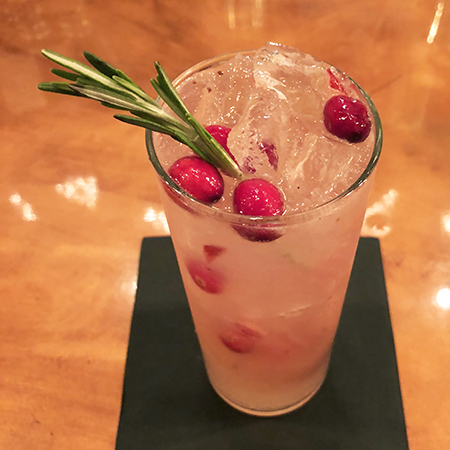 Winter Mule, mixed with Tito's Vodka, fresh cranberries, rosemary syrup, lime and ginger beer. Where is The Vault? Near Beacon Bath & Bubble. 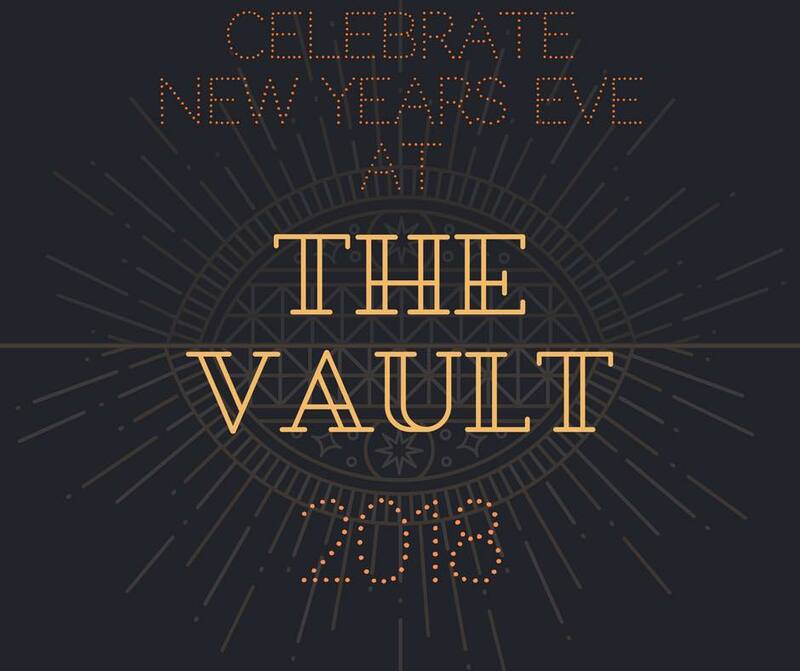 Thank you to The Vault and to BAJA for sponsoring the Restaurant Guide! 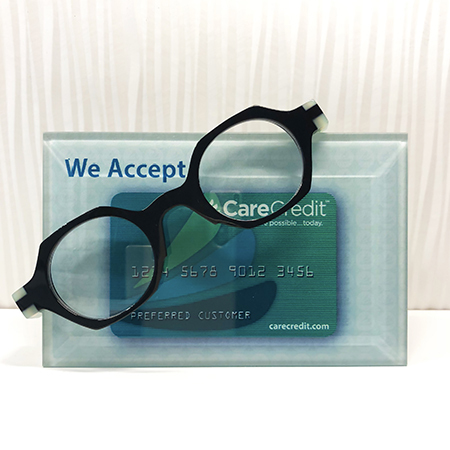 Luxe Optique accepts Care Credit, flex spending accounts, health savings accounts, and vision insurance! Remember that line of Care Credit you got for your cat's operation? If you've paid it off already, you can use the same account for your favorite frames at Luxe Optique! Where is Luxe Optique? Across Cliff Street from Beacon Bread Company. PARKING HINT: Park behind 1 East Main, by the Hudson Valley Brewery, and use the back walkway to come up to Main Street! Distressed fishnet jeans by Free People. Yes, fishnet! 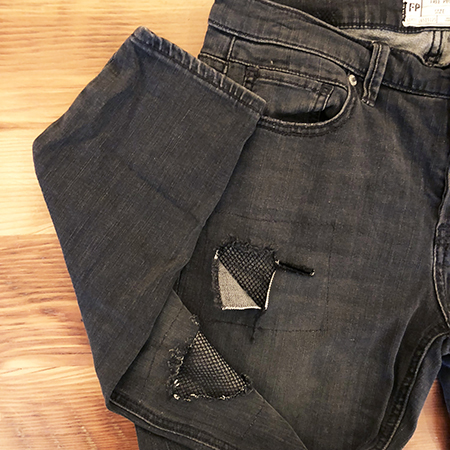 Free People has gotten creative with the neo-traditional pre-fab holes in jeans. Versatile and perfect for all seasons! 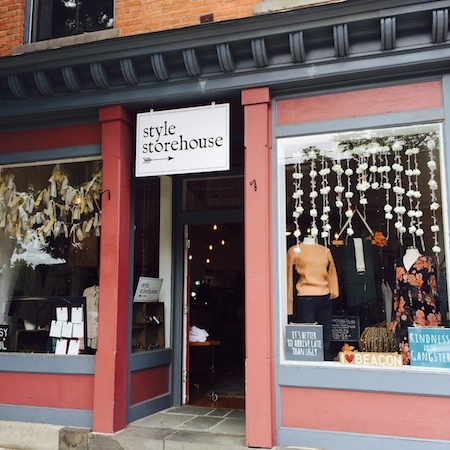 Where is Style Storehouse? Near Waddle n Swaddle. 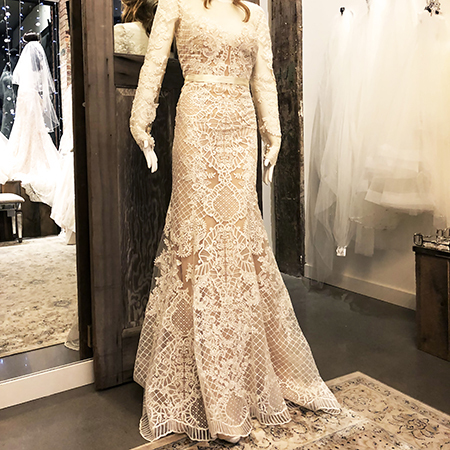 The fit of this Lillian West gown is just stunning, with a unique embroidered lace and illusion neckline, sleeves and back. 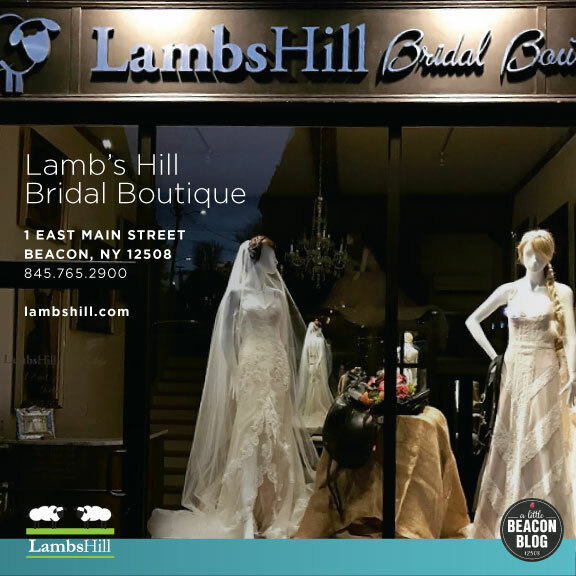 Where is Lambs Hill Bridal? In the renovated factory building near the historic dummy light. Thank you to the following shops for sponsoring our Shopping Guide! 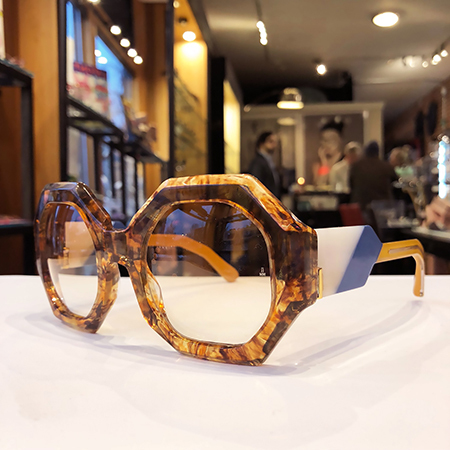 Luxe Optique, Lambs Hill, and Style Storehouse. A Little Beacon Blog's Beauty Guide! 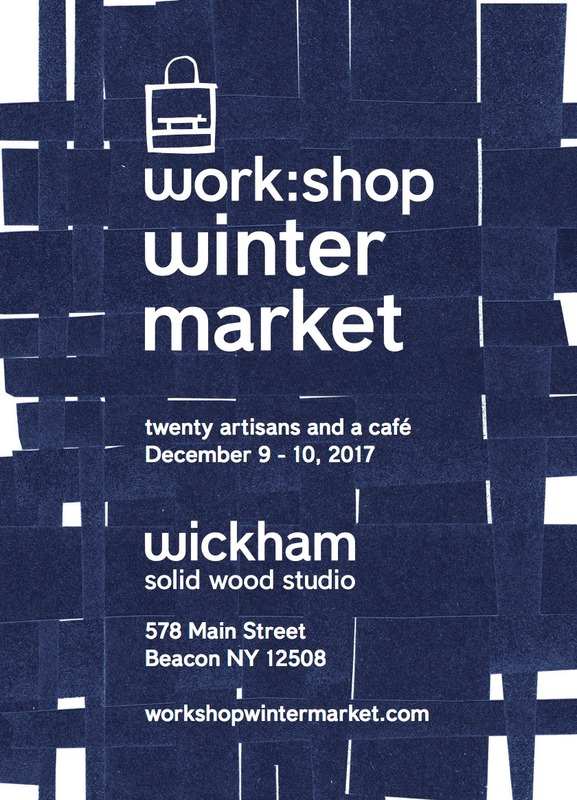 Are you setting up shop in Beacon? Or anywhere in New York? 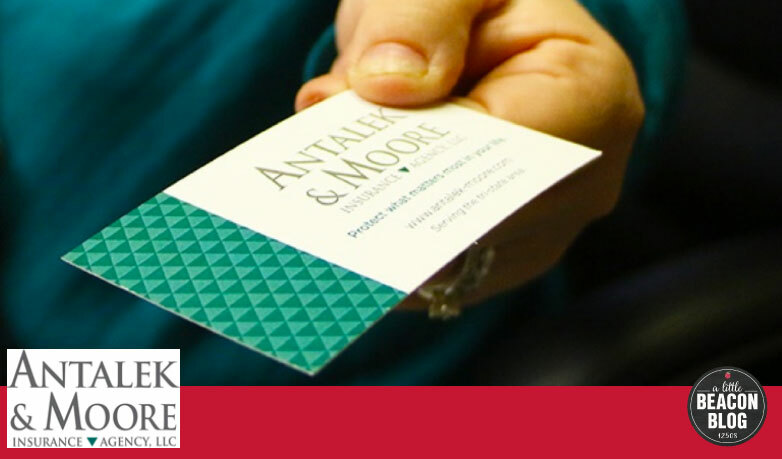 You'll likely want to buy business insurance, and the agents at Antalek & Moore can advise you on what types of insurance you need, and research the best rate. Click here to learn about your options, then call Antalek & Moore today for more information: (845) 245-6292. Do you need new (or used) equipment for your business? Do you need it right now? 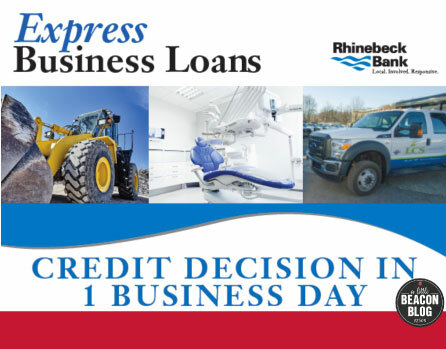 Rhinebeck Bank offers an Express Business Loan, with a credit decision made within one business day on loan amounts up to $250,000. Visit their website for more information or inquire at a branch! Join the Beacon Chamber of Commerce to connect with other businesses and show your support for the community. Want to get people in the door of your establishment? Host a Chamber Meeting! Details here on their website. 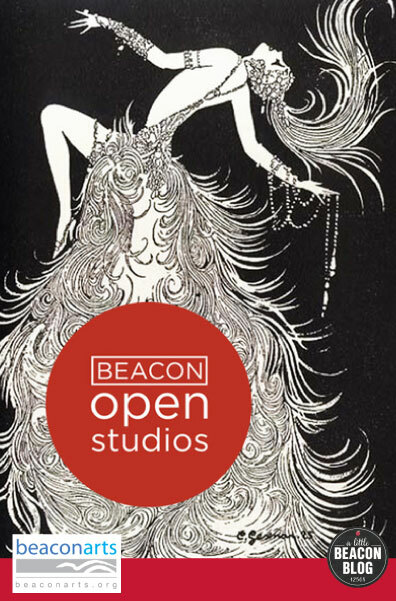 Registration dates for Beacon Open Studios begins soon! Email director@beaconopenstudios.org for more information. Meanwhile, get your tickets online for BeaconArts' upcoming Roaring Twenties Costume Ball and Fundraiser. 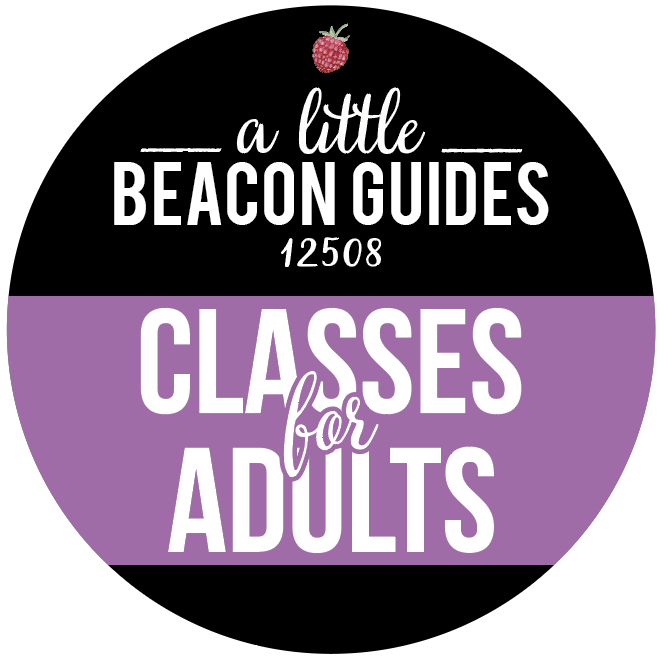 In this class, hosted at 291 Main Street in Beacon's historic Telephone Building, we will go through the process together to get you started on your website. Start with a blank slate, and end with knowing what pages will be on your website. We will use blank pieces of paper, colorful markers, dry erase boards, and other easy ways to help you break free of your fears of creating a website. Get details here! Class size is limited, so reserve your spot. The time is right to host your workshop, now you just need a location. 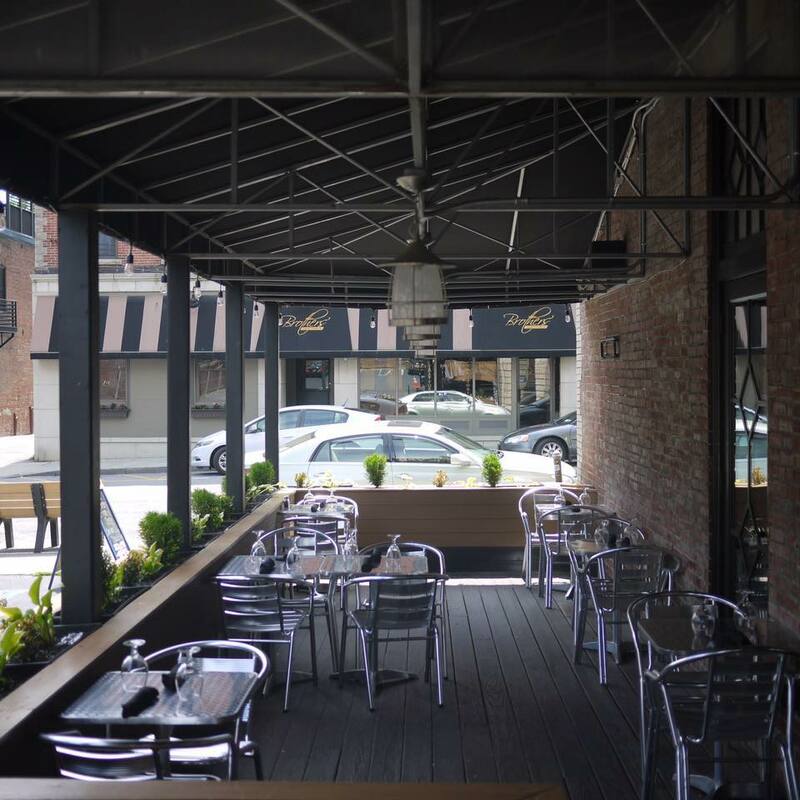 A Little Beacon Space is a perfect location to fit your audience, conveniently located in the heart of Beacon. Need someone to take over managing your social media, or to guide you to improve what you are already doing? 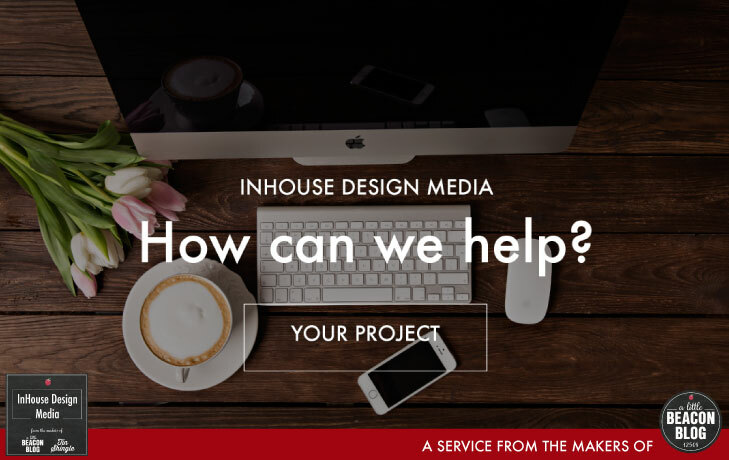 InHouse Design Media can feed you ideas that will make customers take action. Pick one of our Digital Marketing Retainers. 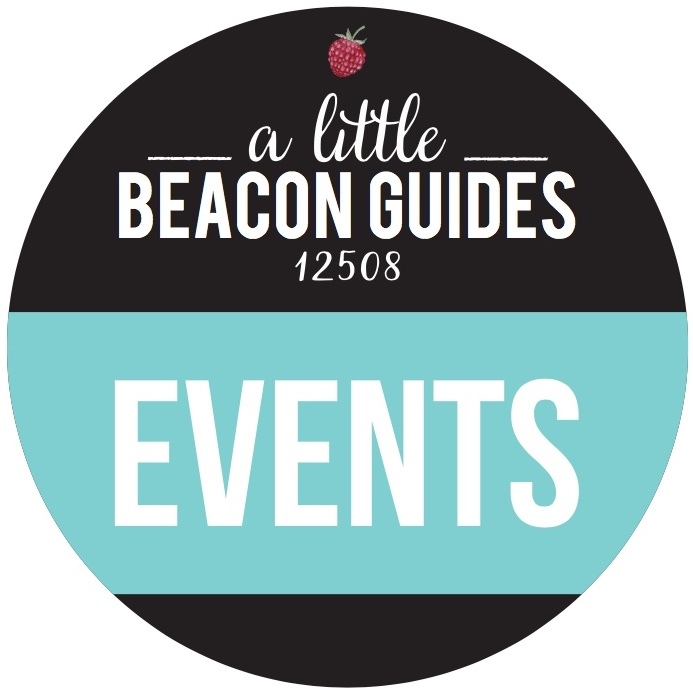 Pictures shown above are from our advertising partners in the Things To Do In Beacon Guides. We can include your most exciting news here too! Sponsors make the local media go 'round. Reach our readers and support our publication at the same time. Advertising with A Little Beacon Blog is effective because we design ways to make it work for you. See our Media Kit for ideas! Click here to learn about ways to advertise on A Little Beacon Blog. One of the Hudson Valley's best-known environmental organizations closed out the year with a bang. On December 27, 2017, Hudson River Sloop Clearwater was awarded a $1,962 grant from Community Foundations of the Hudson Valley, Community Grant Fund – Putnam County to help purchase science equipment for Clearwater’s Sailing Classroom. This grant makes possible the curriculum’s aim to teach young people about the ecology of the Hudson River estuary, according to a news release from Clearwater. Clearwater anticipates that by the end of 2018, more than 600 students in Putnam County will have benefited from using this science equipment. Launched in 1969 by legendary folk singer and activist Pete Seeger, Hudson River Sloop Clearwater has been at the forefront of the environmental movement as champions of the Hudson River. To date, more than half a million people have experienced their first real look at an estuary’s ecosystem aboard the sloop Clearwater. Clearwater has become the grassroots model for producing positive changes to protect our planet. For more information, visit Clearwater's website. 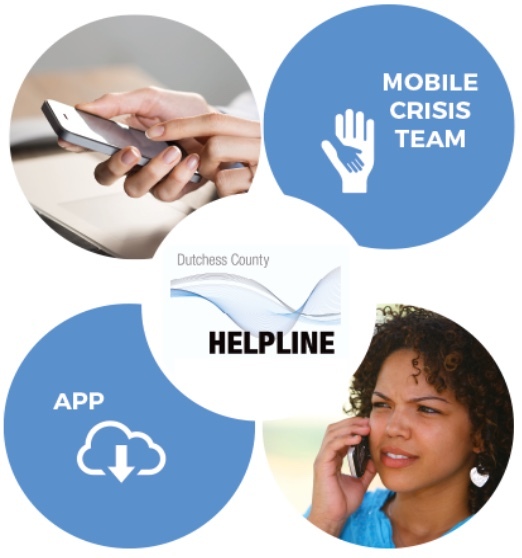 Serving all of Dutchess, Putnam and Ulster counties, the Community Foundations of the Hudson Valley is a driving force in philanthropy in the region, distributing funds from thousands of donors to connect people who care with causes that matter. Administering more than $60 million in assets, Community Foundations works with donors to provide grants and scholarships. The group also establishes endowment funds for nonprofits and other charitable causes, and collaborates with government, private foundations and local leaders to address current and emerging needs. Learn more at Community Foundations' website. This is it! The final days of last-minute gifts - absolutely perfect, just-right, last-minute gifts - that you can find right here in town! Gift certificates, stocking stuffers, glasses that will change your life, jackets, jewelry - oh the jewelry! 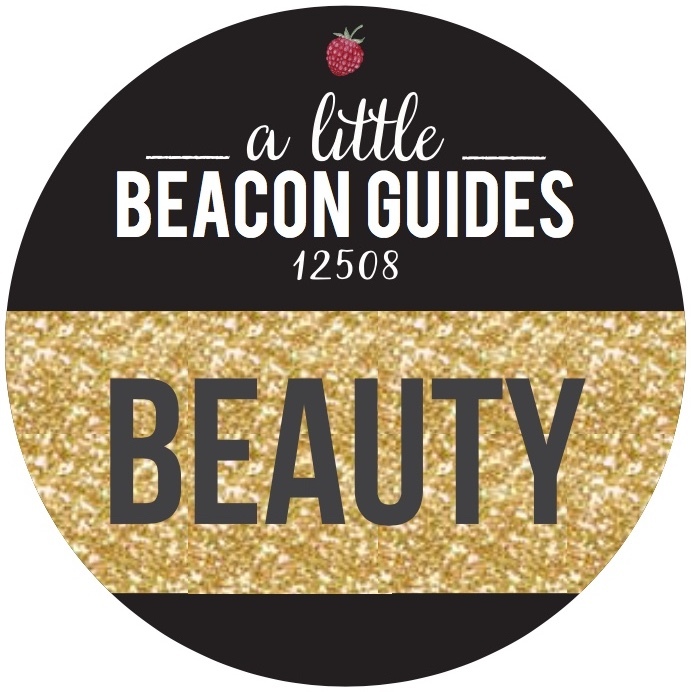 Get out there and be bedazzled by Beacon. P.S. : New shops have opened! Check out which ones in our latest Shopping Guide Shuffle article. P.P.S. : Look at this last-minute gift idea for men, women or kids! Bring The Kids: Winter Break! Warm up at The Vault with a soup and their Burrata of the Day! 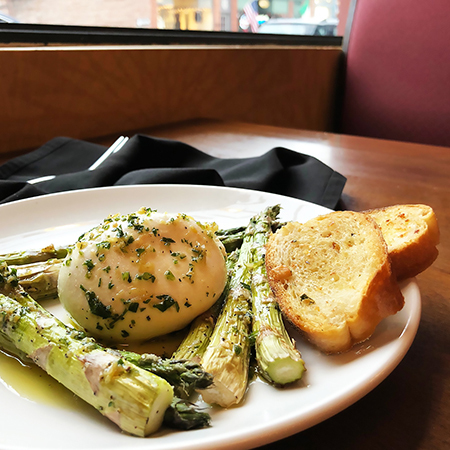 This soft, extra-delicious relative of fresh mozzarella, here is served with grilled asparagus and a house-made sauce of olive oil, salt, pepper, garlic, lemon zest and parsley. Where is The Vault? Near Beacon Bath & Bubble. Luxe accepts Care Credit, Flex Spending, Health Savings Accounts and vision insurance! 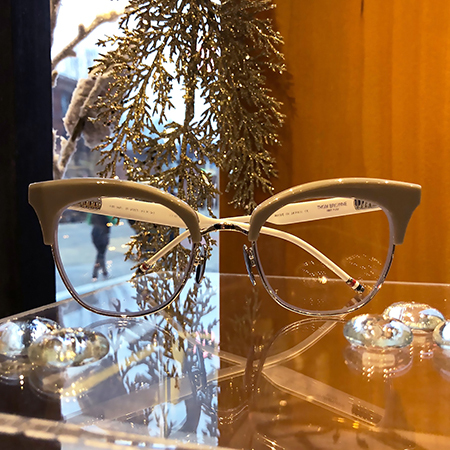 While your wallet options have opened up, check out these extremely limited and luxuriously wild octagonal frames, meticulously handcrafted in Italy by Jacques Marie Mage. Where is Luxe Optique? Across the block from Beacon Bread Company. 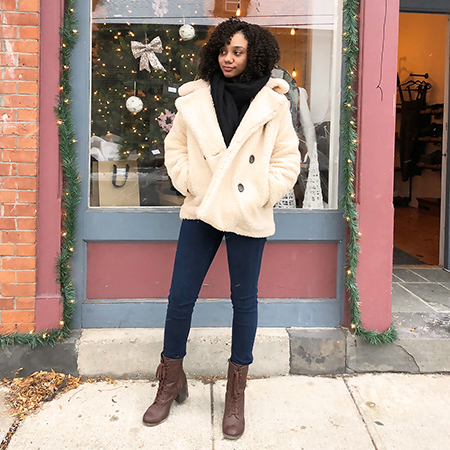 Warm up in the softest, most luxurious plush peacoat by Free People, available now at Style Storehouse. Try pairing it with Free People's equally soft waffle-knit scarf in black. But hurry, only a few are left! While you're in there, check out their boots too. 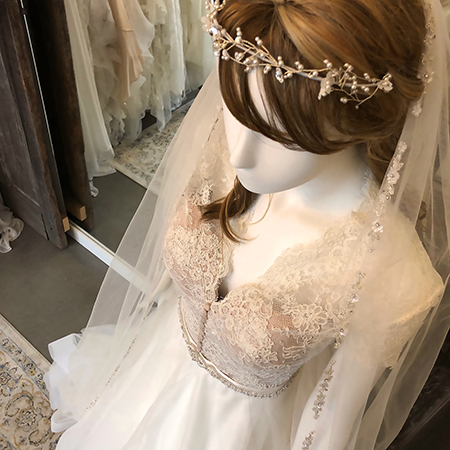 The total elegant package: Stunning sequin and lace bustier by Justin Alexander, Lillian West skirt, belt and veil from Justin Alexander Signature and headband by Richard Designs. 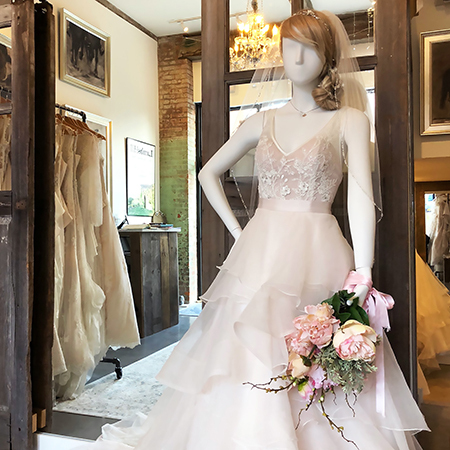 Lambs Hill has a lot of separate pieces that allow you to mix and match, to fully customize your perfect wedding day apparel. P.S. : If you're looking for a tiara for New Years, you could get the headband pictured here. The easiest and most loved gift certificates are those to take care of beauty needs! Find gift certificates to any of Beacon's service businesses - for hot stone massage, hair, makeup, or lashes - in A Little Beacon Blog's Beauty Guide! Give the gift of savings! 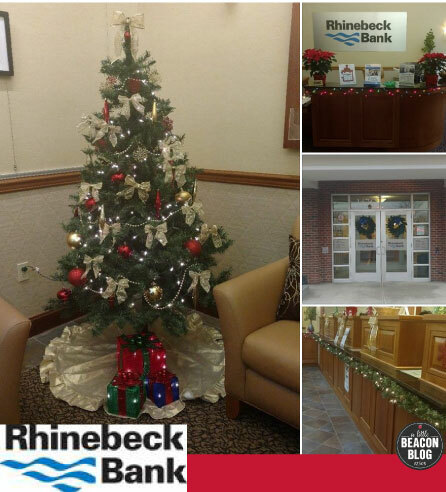 See the latest CD rates available from Rhinebeck Bank today, and visit their festively adorned branch in Beacon across from the Family Dollar. You know you're running around for last-minute stocking stuffers - run here! Give the gift of a Whole Life Insurance Policy to your children or grandchildren while they are healthy. Click here to learn about your options, and call Antalek & Moore today for more information: (845) 245-6292. Are you new in town? 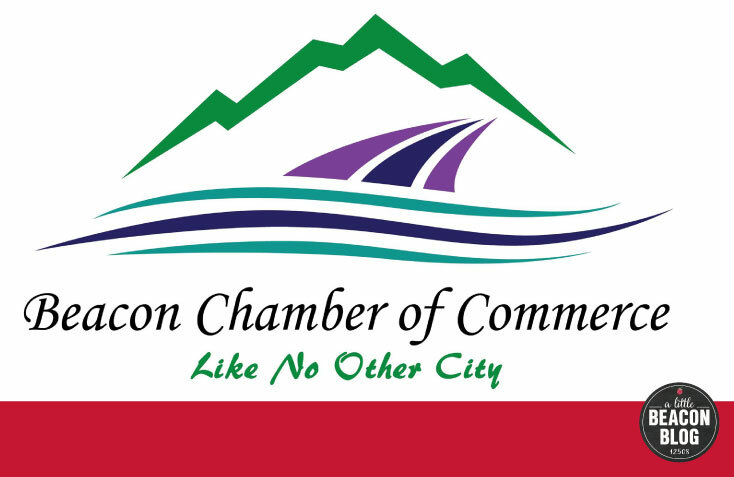 Join the Beacon Chamber of Commerce to connect with other businesses, and show your support for the community. Elections for new board members are in January, so now is the time to hook in with this organization! Click here to join online. BeaconArts reminds you that art is a healer, with this message: "As we look back at an eventful year and look forward to a new one, keep in mind that art is a great healer, a reflection of our humanity, and a catalyst for change. When all else fails, keep pressing forward and keep making art!" Beacon Open Studios, a fiscally sponsored project of BeaconArts, is hosting a Roaring Twenties Costume Ball & Fundraiser in honor of their 10th anniversary at Dennings Point Distillery on Friday, January 26, 2018. Details and tickets here. Now available! 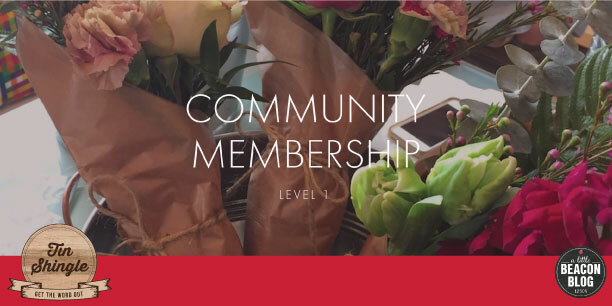 The Community Membership to Tin Shingle. This starts at $45 per month, and includes monthly in-person meetups in Tin Shingle's HQ - The Telephone Building in Beacon! Shhh... don't tell the other cities in this country, because right now, the only Tin Shingle members receiving the in-person treatment are you Beaconites and Hudson Valley peeps. When you're ready, the All-Access Pass of Membership includes instant streaming of all Training TuneUps, as well as Media Contacts and a cheat sheet of advance notice for what magazines are publishing. This helps your business get featured in the media. Learn about Membership here. 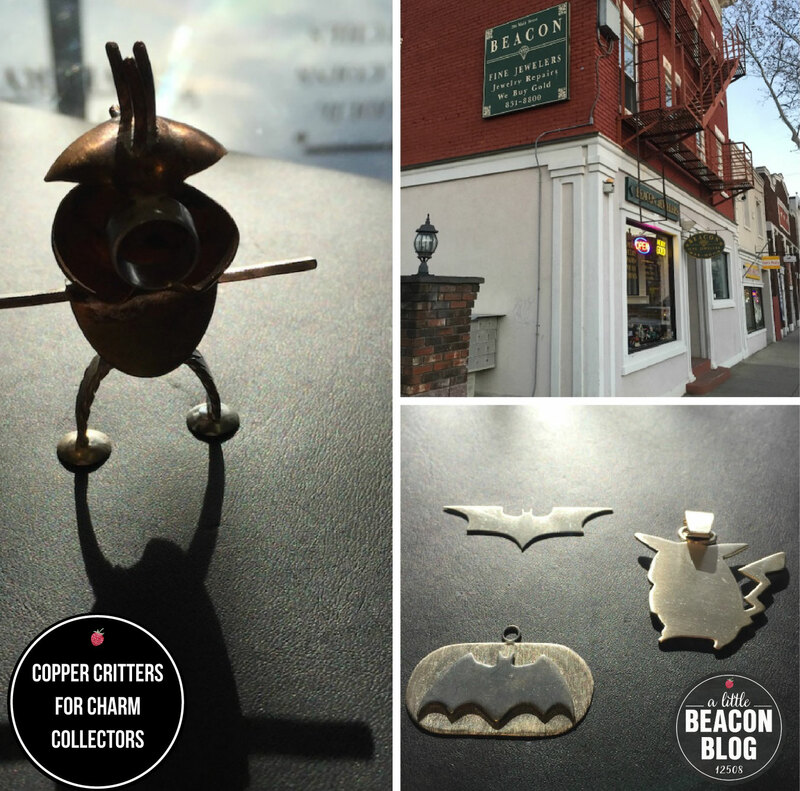 "I recently had a holiday pop-up at The Little Beacon Space, and it exceeded my expectations! Katie and her staff were more than accommodating and helped make our weekend-long market a huge success. The central location meant tons of foot traffic from the train, while the beautiful, open space meant minimal decorating and easy, effortless set up and break down. 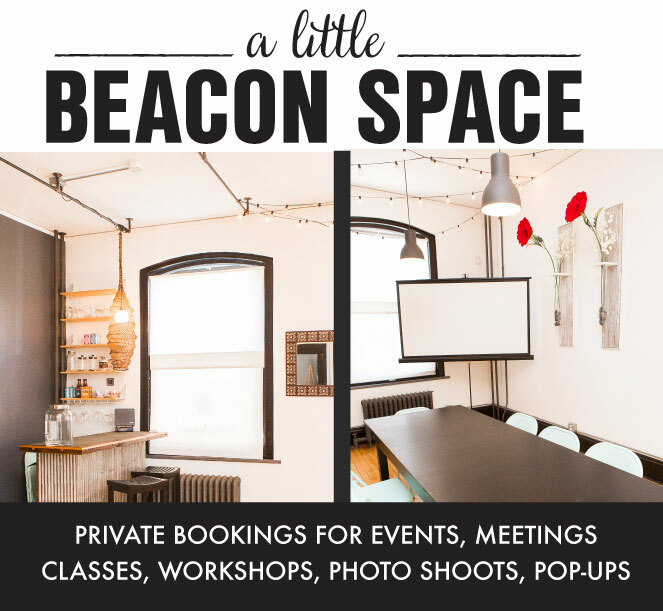 "Hosting this pop-up at The Little Beacon Space helped me gain exposure through LBB’s amazing and thoughtful article (included with your rental! ), while also allowing me to grow my audience locally and test-run my shopkeeper skills for the future. It’s a low-pressure, high-reward situation and I highly recommend it. "I would also recommend purchasing a weekend rental and taking your chances. We made our money back and then some. Thank you, LBB!" 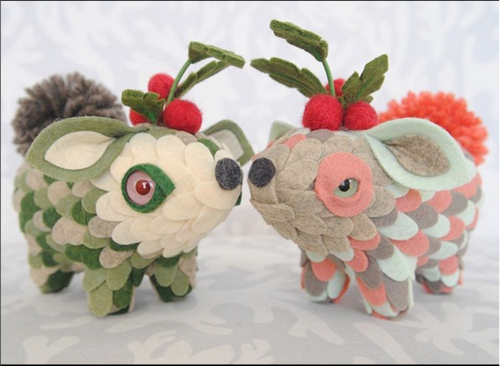 InHouse Design Media has partnered up with Tin Shingle to bring you in-person classes! The first one: "Start Your Website!" 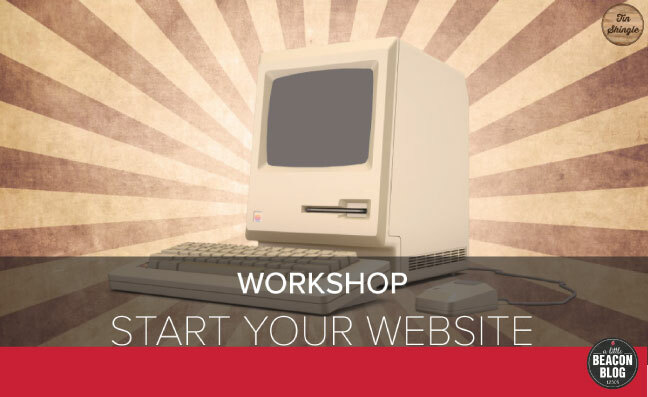 In this small group class, attendees will come away with a roadmap of their website - which pages they'll include - and possibly start their website themselves! Sponsors make the local media go round. Reach our readers and support our publication at the same time. Advertising with A Little Beacon Blog is effective because we design ways to make it work for you. See our Media Kit for ideas! 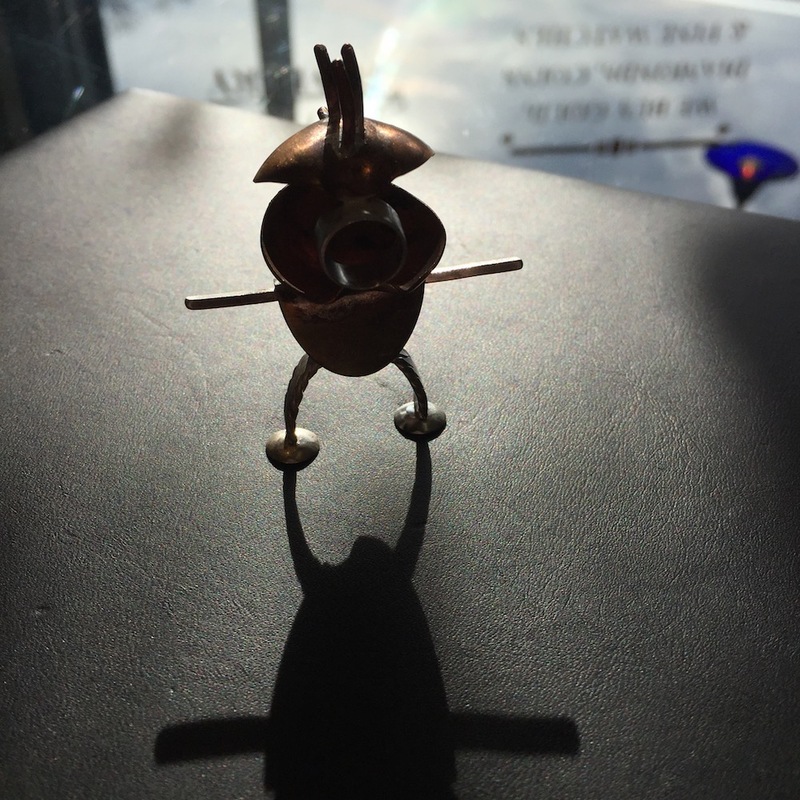 We're betting that you haven't seen these little copper critters yet, created at Beacon Fine Jewelers, Inc. in the middle of Beacon at 284 Main Street. The shop is in that nondescript part of Main Street across the street from the Howland Public Library, so you may have walked past their window several times, maybe making a mental note to see if that ruby ring in your jewelry collection is real or not. That's how I first walked in - on the gemstone detective mission - but I was immediately distracted by these little copper critters created by Mitch Rios, the son of Elliot Rios. They both metalsmith from behind the torch in back of the shop. The duo have been working in Beacon since about 2003. They commute over the bridge from Newburgh to their shop here to repair jewelry or clocks on the spot. Mitch started designing these...droids? copper critters? from old pennies. Fitted with a loop at the top, you could wear it as a charm, hang it from a window or rear-view mirror, or simply collect them as a little standing army. Several of the creative beings are available, each bearing different characteristics. 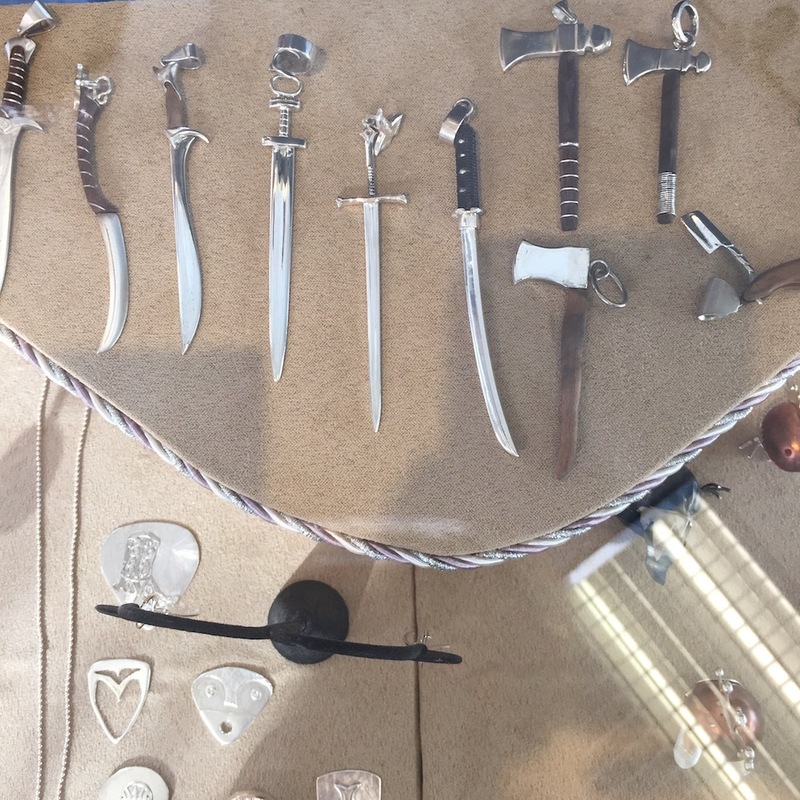 In addition to the copper charms (above), Mitch designs character charms out of silver (below), like the Batman ninja piece in this picture, or the Pokémon charm. Is there a knife collector in your life? A precise charm may be just what he or she needs. Each of the different types is custom-designed and made by Mitch. 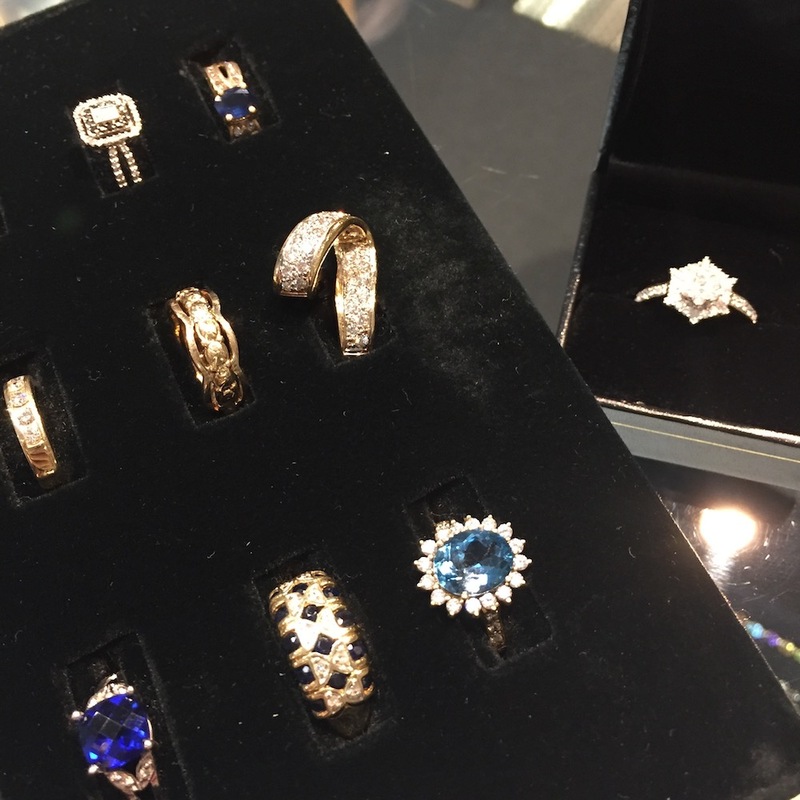 Of course, you'll also find traditional pieces of jewelry in rows of cases inside Beacon Fine Jewelers. Some items are pieces they have bought from estates, others are their own designs. 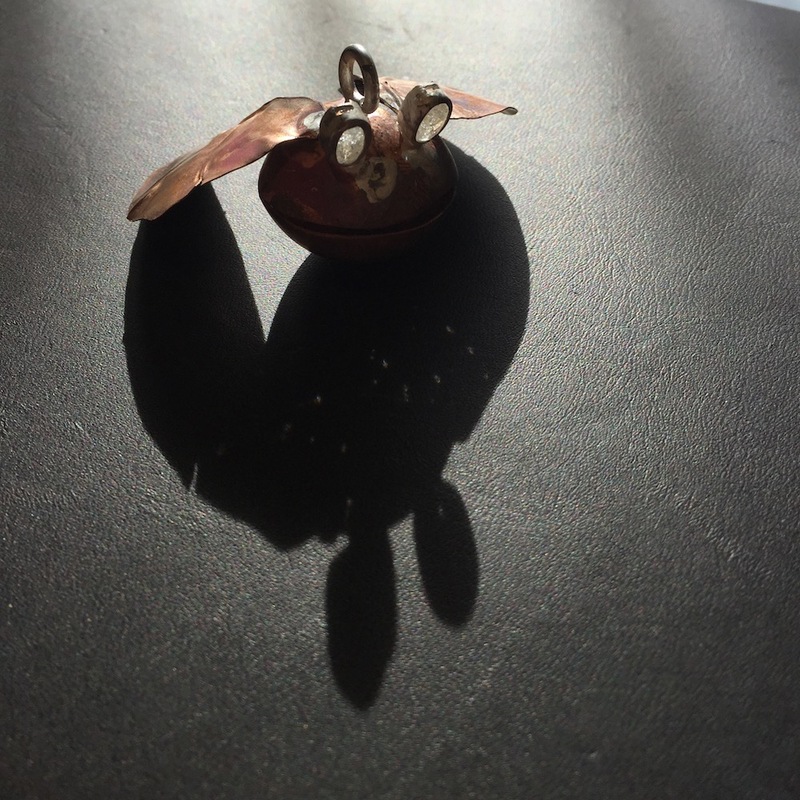 Do you have an idea for a ring? Sketch it out and bring it to Elliot. He would love to make it for you as a custom piece. Happy Thursday - the east end of Beacon by the mountain is open late! 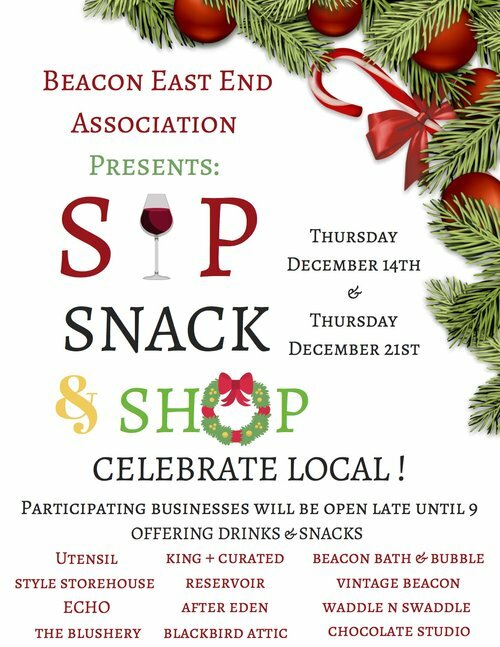 The Sip, Snack and Shop event is tonight, celebrating local shopping and support of neighbors, so sip something sweet in the holiday sparkle of the night as you find last-minute 🎁 gifts! 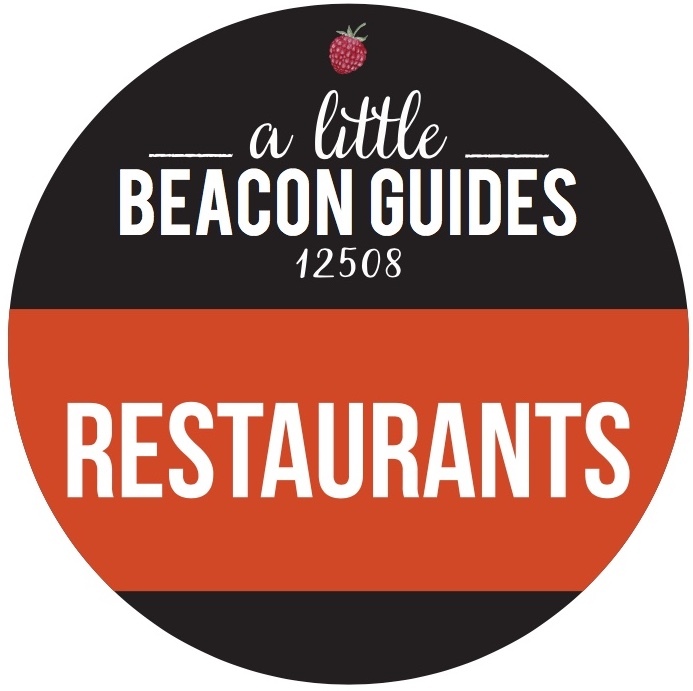 Presented by the Beacon East End Association, this is their effort to help you see all of the amazing that is inside more than a dozen stores. You’re not just buying local for the sake of buying local. There is some really cool shizaz here! Style Storehous, Utensil Kitchenwar, Lambs Hil, Echo Women's Boutique and Toystor, The Bra Fit Exper, Kaigh, The Blusher, Vintage:Beaco, Waddle n Swaddle, Beacon Bath & Bubble, The Chocolate Studi, Blackbird Attic Boutique, an King + Curate. Photo Credit: Screenshot from Planning Board Video recorded by Peter Skorewicz. After 22 years of public service to Beacon, NY, the chairman of the Planning Board, Jay Sheers, has resigned his position. He previously served on the Zoning Board, and his time on the Planning Board has coincided with some of the biggest growth in Beacon's history. He told the public of his decision during the December 12, 2017, Planning Board meeting, before the start of the meeting. The meeting was expected to be heavily attended, as development projects were on the agenda. Specifically, the meeting centered on a vote about a planned large apartment complex known as 22 Edgewater Place (see details about this in A Little Beacon Blog's Building and Development Guide), which is proposing 307 apartments in seven buildings, to be built in the woods above the train tracks near Pete and Toshi Seeger Riverfront Park. The Planning Board voted to allow the project to proceed to the next step in its development cycle. “I’m debating a personal note, so I’ll do that now, because it may appear that I’m leaving the Board because of this [refers to the audience], but it’s not true. I’ve been thinking about leaving the Board for a long time. So and tonight is my last Planning Board Meeting. I’ve been on this Board since 1995 and I’ve been the Chair for 10 years. Before that I served on the Zoning Board of Appeals. "It has been extremely gratifying to have worked with the many people who have given so much time and effort to bring about the large number of positive changes that have taken place in this fascinating and wonderful City over this period of time. "Recently, demands on my time from my job and my growing extended family make it harder and harder to fully prepare for and attend meetings. I know that the City is in the middle of a lot of important work, but that’s pretty much always the case. Waiting for a good time to step out would mean that it would never happen. You can watch the full video here, and see what was on the agenda. Have you seen all of the scaffolding up around Beacon? For the past few years, greenlit development projects have been humming along, from concept to construction. Some of these projects are easily noticed around town, and some are less noticeable when on regularly traveled streets. As development and construction are becoming hot topics in all of the city meetings, including City Council, Planning Board, and Zoning Board of Appeals, it can be very hard to keep up with which property is which, and where, and owned by whom. A Little Beacon Blog has started keeping a Guide of these projects. Reference it when you spy new bulldozers, or any time you want to get up to speed real quick as to where a project is, and what you need to know about it. Building in Beacon is happening very quickly right now. 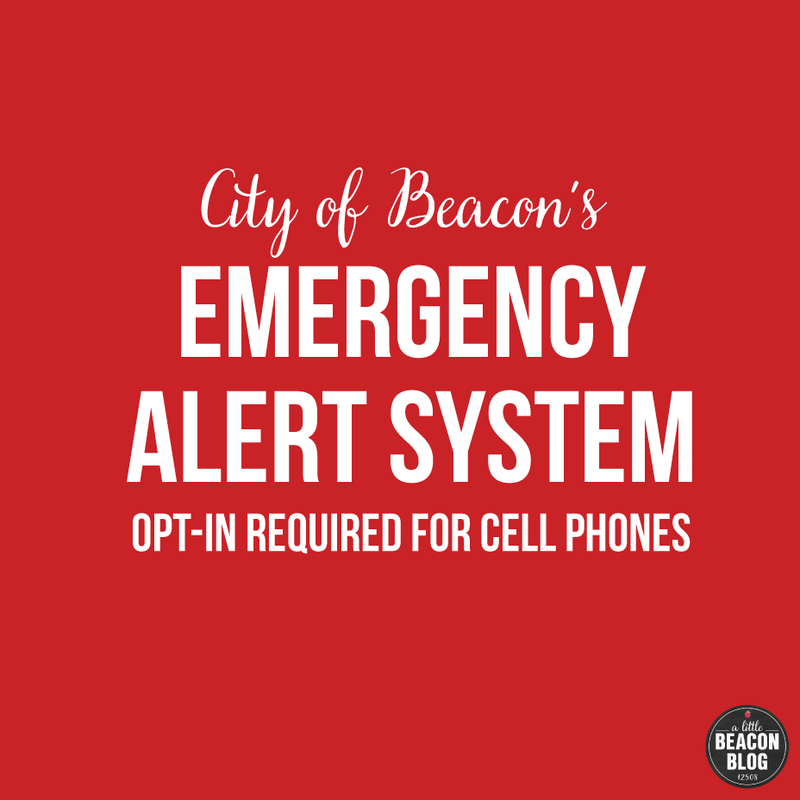 While it seems overnight to people who have not followed the news about it, or attended meetings of the City Council, Zoning Board or Planning Board, it is very much the norm for Beacon residents who have followed those meetings. The thing is, many buildings that you have been looking at for years and years are about to go away, to be replaced by new construction. In most cases, that will mean taller buildings. Arguments can be made about whether that's a good or a bad thing, but no matter what, when you eventually see them, those new structures will likely induce some feelings in you. For instance: A project called Edgewater plans to have seven buildings and 307 apartment units, to be located in the woods along the Hudson River, slightly northeast of and uphill from Riverfront Park. The project has been granted a vote to go through the process of getting approvals to move forward and get closer to building. 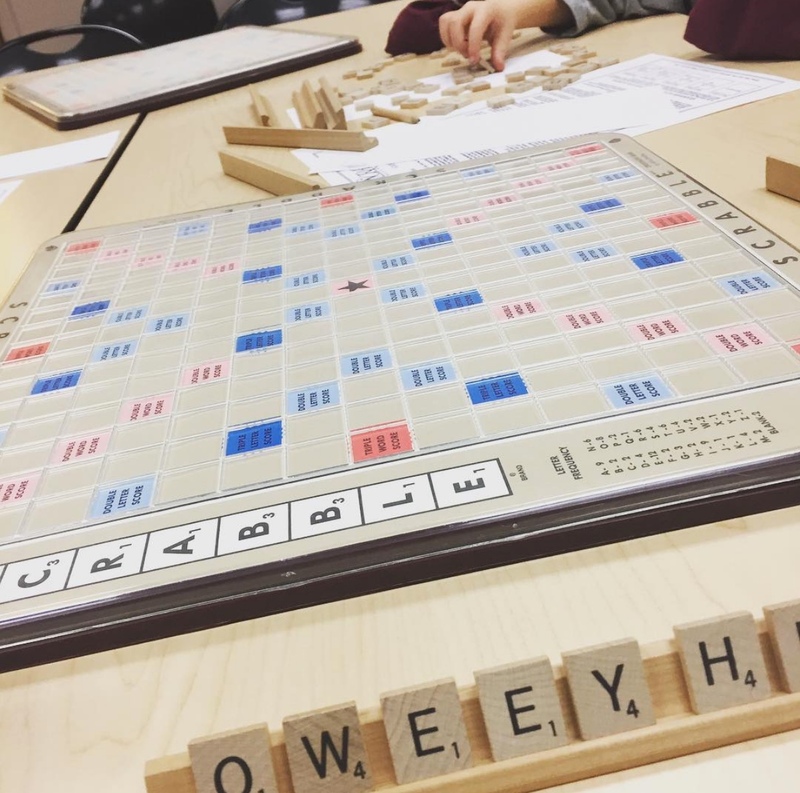 This project was held up for several months while attorneys for the Beacon City Schools' Board of Education argued that so many new residents would have a negative effect on the current school district, as the rapid influx of new kids would overwhelm classrooms. The development attorneys and the City Planner did not agree. Yesterday, finally, a vote was cast by Beacon's Planning Board, and it was voted that the impact would not negatively effect Beacon City School, and that the project could move forward. There are many other potential issues with this project. Among them: anticipated traffic impacts. The official projection is that vehicular traffic from this 307-unit collection of buildings (essentially a community) will not impact current traffic. This is just one example. Up on Main Street, the old single-story building across from Homespun Foods was demolished this week; a new building is set to replace it. The empty factories at Madam Brett Park are proposed to be new apartment buildings. All of these projects are moving forward at the same time, and while it's exciting in theory to watch it all, people living in Beacon are feeling a desire to take a minute to catch up, to see how these are planned to progress, before it all happens, and to learn more about who owns these properties. More and more residents are "coming online" about this issue. People who normally don't pay attention to boring Zoning Board meetings are starting to pay attention, so that they can know what to expect - what's coming down the pike. Because no matter what, when you see major construction happening, it can be surprising. In Beacon, there are only a few local media sources. A Little Beacon Blog, The Beacon Free Press, and based in Philipstown but covering Beacon, The Highlands Current. Which sometimes makes it difficult to get information. Facebook groups often turn up leads, but are awash with emotion, speculation, facts, and everything else. Beacon beat reporter Jeff Simms has been covering these building projects for some time for The Highlands Current. A Little Beacon Blog will begin covering development as well, and we will do so as carefully as we can. The learning curve is steep, and we are all in this learning process together. The feeling of Community is very strong in Beacon. That feeling does not exist in every community - it's something really special here. There is a desire to preserve that feeling, and continue living small, even while the city grows. Living smaller but bigger. It's possible, it's just a careful job. 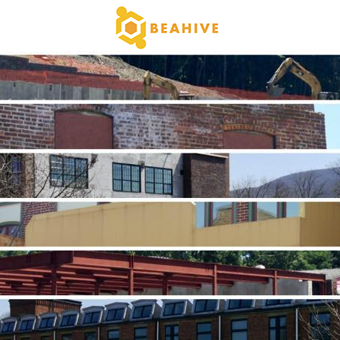 This Saturday, The Beahive is hosting a public forum that focuses on zoning in Beacon. It seems to serve as a Zoning 101 for people who are unfamiliar with nuances in Beacon's code that could allow - or not allow - buildings to get built in a certain way. And exactly what that "certain way" is, is varied and can look like pretty much anything. To help see what that looks like, the forum this Saturday at Beahive will be facilitated by City Council Member Lee Kyriacou (who will be acting as a private citizen, not representing Beacon in any official capacity). Those who watch City Council meetings or other meetings know that Lee is one for detail, whose jam seems to be property issues. At a recent City Council meeting that had a very large public turnout to discuss the rezoning of Central Main Street, Lee commented that he was happy to see how many people were "nerding out" about issues that usually very few do. The whole City Council, the Mayor and the City Administrator are working together to address growth issues in Beacon. A number of planning and zoning experts will be at the Beahive event to take questions from the audience. The forum is on Saturday, December 15, from 9:30 to 11:30 am at Beahive, in the Telephone Building at 291 Main St., Beacon, NY. Your Winter Wonderland dreams are coming true! This year, there is a good chance we'll all be able to go through a holiday lights show that isn't completely muddy! We are in the season of Elfing! Elf magic, as made by you. Gifts, cards, porch drop-offs, little special things you are doing for people. For ideas on food pantries to contribute to, see our Food Pantries Guide here. For amazing gift ideas and lustworthy things you might need, see our Shopping Guide. It's always being updated, and currently has new shops on both ends of Main Street. Want to be in A Little Beacon Blog? 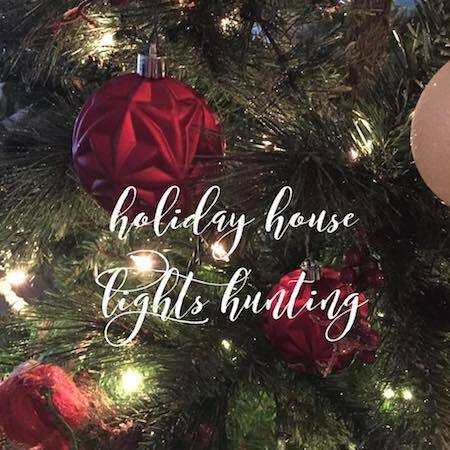 We are going Holiday House Lights Hunting in Beacon and want to know where your light display is. Submit cross streets or addresses in the comments section of this post, or send an email to editorial@alittlebeaconblog.com. Bring on the magic! Time: Shops open until 9 pm! Shops on the East End of Beacon have aligned to help bring awareness to that end of town, after the sharp curve in the road where people don't think to venture. Take the adventure! Follow the sidewalk until it ends. Participating shops will be open late, starting at Beacon Bath & Bubble, through Utensil, Waddle n Swaddle and Style Storehouse, all the way to The Blushery. Just keep walking! Park in the free parking lot by The Green Room, or down behind SallyeAnder in the free public parking lot at Hudson Valley Brewery. In light of the current development boom in Beacon, with some resulting snafus and public outcry, the City of Beacon is reviewing its zoning laws. Come to this open meeting to learn how zoning works, what current zoning laws are, what proposed changes would do, etc. Questions are welcome. City council member Lee Kyriacou will facilitate the discussion — operating in this capacity as a private citizen. He’ll be joined by a number of planning and zoning experts. There’s no particular stance at the meeting, just open and honest information sharing. Feeling blue right now? Then this event may be for you. 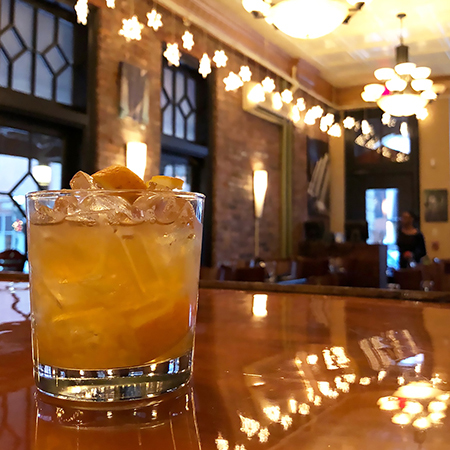 "Deck The Halls At Cafe Sizzle"
Come in to The Vault, and relax with a nice Vanilla Old Fashioned, mixed with Beacon Bourbon, housemade vanilla simple syrup, fresh orange and apricot bitters. Take in the aroma, then order a cheese plate for a perfectly paired snack! Where is The Vault? Near Beacon Bath & Bubble. Gorgeous. That's how these festive, cat-eye, high-end handcrafted frames by Thom Browne will make you feel. The square semi-rimless glasses in gray and silver are luxurious, indulgent, and bold. PARKING HINT: Park behind 1 East Main, by the Hudson Valley Brewery, and use the back walkway entrance up to Main Street! A rotating cast of accessories completes an outfit, while keeping it distinct from the last time(s) you wore it. New jewelry by Five and Two is on the shelves at Style Storehouse, where there's always good music playing and sweets at the counter. 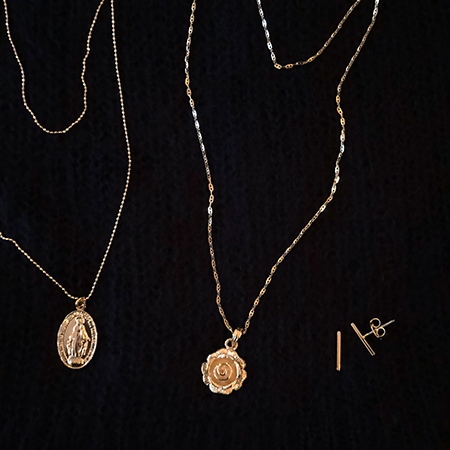 Charm necklaces are gold-plated and great for layering, or are lovely alone. Try them on. Play! This dreamy two-piece gown by Lillian West features sequin embellishments, a sweetheart neckline and natural waist. The perfectly shaped ballgown skirt is made of tulle and has a chapel-length train. Simply beautiful. Thank you to the following shops for sponsoring our Shopping Guide! 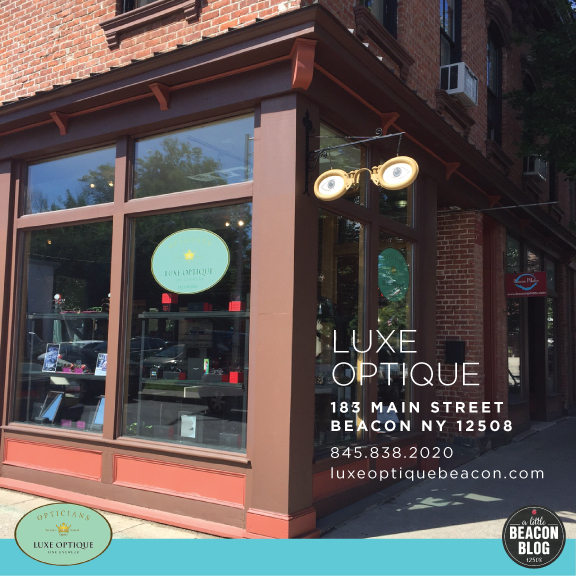 Bellus on Main, Luxe Optique, Lambs Hill, and Style Storehouse. The easiest and most loved gift certificates are those that take care of Beauty! Find gift certificates to any of Beacon's service businesses - for hot stone massage, hair, makeup, or lashes - in A Little Beacon Blog's Beauty Guide! It's your last chance to participate in Rhinebeck Bank's collection of new toys for Grace Smith House's annual toy drive, benefiting kids who stay with them during times of safety and transition. See here for more information on how you can donate. Gift the gift of a Whole Life Insurance Policy to your children or grandchildren while they are healthy, thereby making it easy for them to take over as adults and keep the lower rate. Call Antalek & Moore today for more information: (845) 245-6292. Are you new in town? 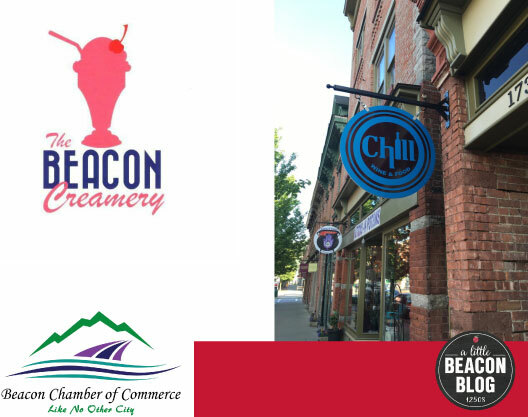 Join the Beacon Chamber of Commerce to connect with other businesses and show your support for the community. Elections for new board members are in January, so now is the time to hook in with this organization! Click here to join online. The Illumin8 2017: BHA + BeaconArts Bicycle Menorah has begun. You'll find the unique menorah on display at its new location, the Beacon Building at 427 Main Street (the building with the green NuSpecies sign). A new wheel lights up on each of eight nights in honor of different groups: Volunteers, Educators, First Responders, Children, Business Owners, Clergy, Activists, Artists and Musicians. 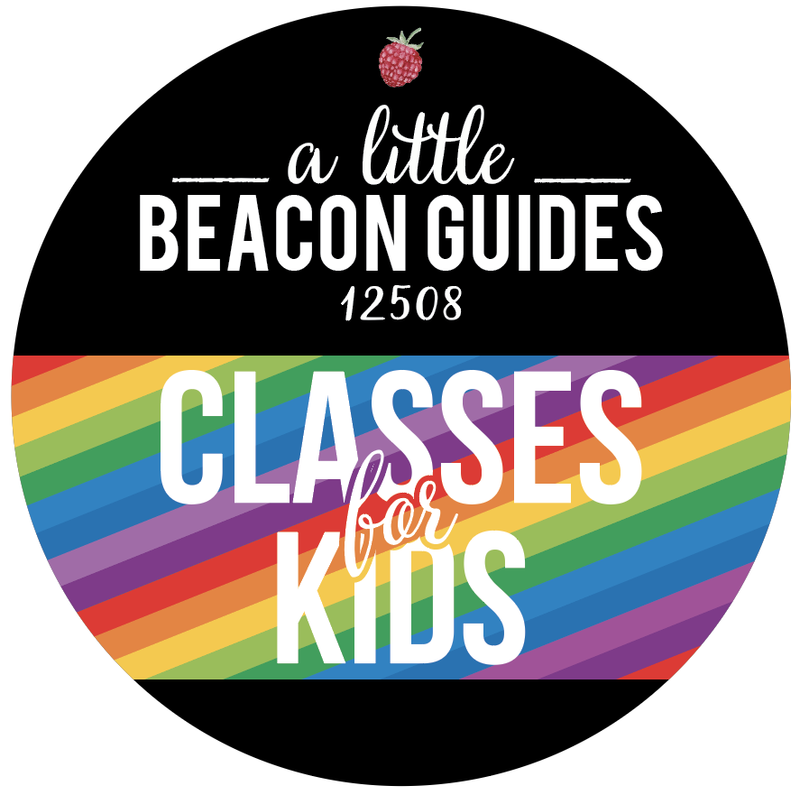 One of the best ways to make sure this uniquely Beacon tradition continues is by making a donation to BeaconArts, which you can do right here, online. 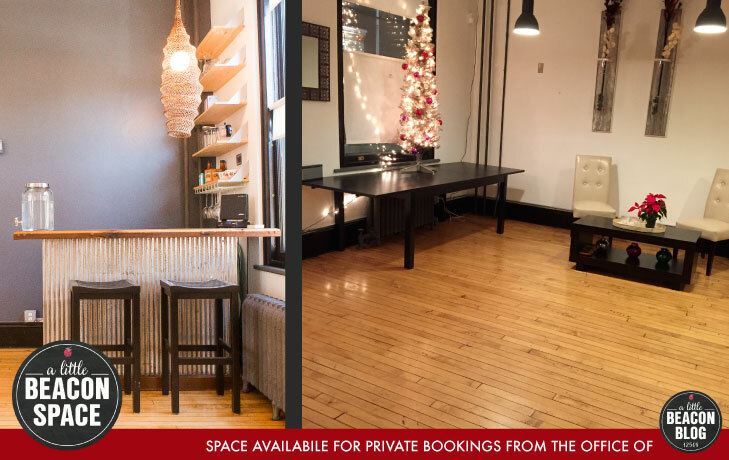 Need a last-minute location for your holiday event? A Little Beacon Space has our sleek tree up! To book your private event, see here for pictures and details. Are you stuck on something with your website? Do you have bunches of questions? 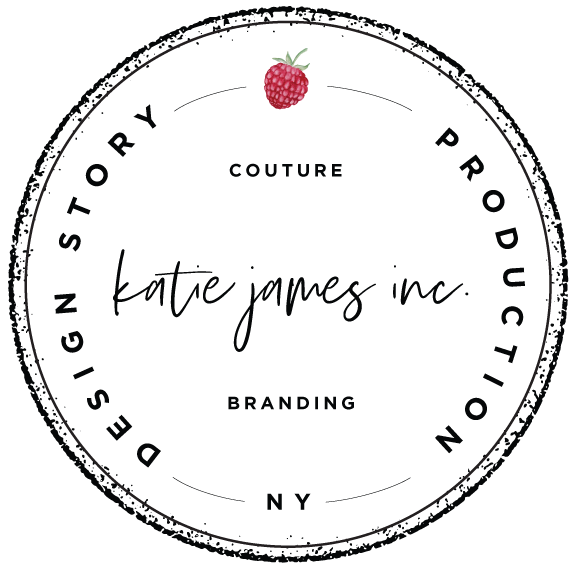 InHouse Design Media is designing in-person classes for you to attend. Got questions? Let us know about them and we might offer a class to find answers! All of the pictures shown above are from our advertising partners in the Things To Do In Beacon Guides. We can include your most exciting news here too! Holiday House Lights Hunting Begins - Where Are Yours? It is time once again... We are going Holiday House Lights Hunting in Beacon and want to know where your light display is. Submit cross streets or addresses here in the comments, or send to editorial@alittlebeaconblog.com. Bring on the magic! Beacon is Open Late on the East End! Sixteen shops have joined together to stay open till at least 9 pm tonight, Thursday. Happy shopping! Next Thursday, they'll offer another late night, in addition to being open extra days, to optimize local shopping convenience. The Sip, Snack, & Shop is presented by the Beacon East End Association, a group of 16 stores working to bring more awareness - and people, especially local Beaconites - to follow Main Street's curve to explore all of the shops on the east end of town. Kitchenware, underwear, boots, skirts, jewelry, art - there's so much! The Monday evening after Thanksgiving, Peter and Ruth Robillard were inside their home watching a movie when Peter heard a popping sound outside, and ran out to find his front porch on fire. At 7:13 pm, first responder units were dispatched "for trees on fire next to the residence," according to the Beacon Professional Firefighters - IAFF Local 3490 via their Facebook page. The couple got out of the home safely, and a fundraising page has been set up in their name, collecting over $8,000 so far from 109 people. According to The Beacon Professional Firefighters - IAFF Local 3490, less than 2 minutes later, the first to arrive found a large blaze on the front of the house, with the fire reaching into the porch area and inside the home from the brush near the sidewalk. "A second alarm was transmitted at 7:17 pm by Assistant Chief Lahey, which provides for station coverage and a callback of off-duty firefighters for assistance," according to The Beacon Professional Firefighters. At the scene were Career Firefighters, an Interior Volunteer Firefighter, and three Exterior Volunteers. Beacon was also assisted by the Village of Fishkill, initially as FAST (Firefighter Assist and Search Team). They were used to assist with overhaul and ensuring that the fire was out. At 7:54 pm, the fire was declared under control, and the salvage and overhaul process got under way. By the end of the incident there were approximately four interior, four exterior, and four fire police volunteers, according to The Beacon Professional Firefighters - IAFF Local 3490 Facebook page, all of whom left by 11:08 pm. From the Beacon Professional Firefighters: "Due to the fast actions by the Career Firefighters on the initial responding units, the fire extension and water/smoke damage was limited to a portion of the house. Remember, the Beacon Career Firefighters are dedicated to your safety 24/7." You can donate to the Beacon Fire Department by responding to mailings that go out, and by purchasing a Christmas tree from their lot near Dogwood at 60 East Main Street. Donate to the Robillard Family by clicking here. When the trees were taken down at 51 Orchard Place in Beacon, one resident who was watching them fall said she felt "scared." The home that sits up on the mini-hill at 51 Orchard Place, at the base of the Y that loops East Willow and West Willow to regular Willow Street, had recently come under new ownership by Fortress Enterprises, LLC, after being empty for quite some time, according to a parcel search with Dutchess County. "I have watched this house deteriorate for over 6 years. I was really excited to see that someone had bought it and was beginning to bring it back to life," said Karen Nelson on December 4, 2017 at the City Council meeting. She spoke during the Public Comment portion of the meeting, where people can address the council members with anything on their minds. Several mature trees were cut down at 51 Orchard Place - more than the three mature trees that are allotted for in Beacon's city code. "After all the trees fell, the light had changed. The noise level was higher," Karen said. "The sight lines into neighbors' houses across the street were clearer. And theirs into mine." The noticeable shift to the space, as well as the addition of a new driveway, prompted Karen to look into the matter. Word on the neighborhood circuit was that the house was being refurbished to be a $500/night Airbnb property. This house wouldn't be the first in Beacon to be used for Airbnb, but it seems to be in the first wave of properties used solely for different short-term renters without owner occupancy. Beacon has yet to create regulations around Airbnbs, while New York City has addressed them. Fines of $1,000 per violation have already been issued. According to The Verge, "The law under which they were charged fines people who rent out entire apartments for fewer than 30 days. State lawmakers believe those rentals encourage property managers and owners to construct what essentially amount to hotels in residential buildings." Airbnb sued New York City in 2016 over the law, according to The Verge, but dropped the lawsuit after it settled with the city in December. "Airbnb agreed to allow New York to pursue violators so long as prosecutors only went after hosts, as opposed to the company itself." Airbnb has disrupted the travel and hotel industries, and now the change is coming to smaller destination communities as they decide how to fit vacation rentals alongside full-time residents. Beacon has yet to regulate the issue, but the easy access Airbnb gives to creative locations has spurred people from all over to visit Beacon. Personally, we have received an Airbnb's order of pizza (wrong address), and people from California one day came to our front porch and rifled through our mailbox looking for house keys - because they had the wrong address for their Airbnb. 51 Orchard Place after the removal of trees and the addition of a driveway. "This is shocking to me," said Karen before the City Council. "In every Beacon zoning map I could find, it shows that this neighborhood is zoned for [Single-]Family Homes. And I emphasize the word 'homes.' It doesn’t say houses or structures or buildings. It is a residential neighborhood." Hey, You Dang Kids... Get Off My Lawn! "Kids" here being the figurative word for the sudden attention on this private property and their choice to take down trees that were unhealthy, that did not produce full greenery anymore, and were gangly, virtually hiding the home from view. Depending on which side of the house you are on, one may even say there is now a better view of Mount Beacon as you drive around Orchard Place to turn onto any of the Willow streets. 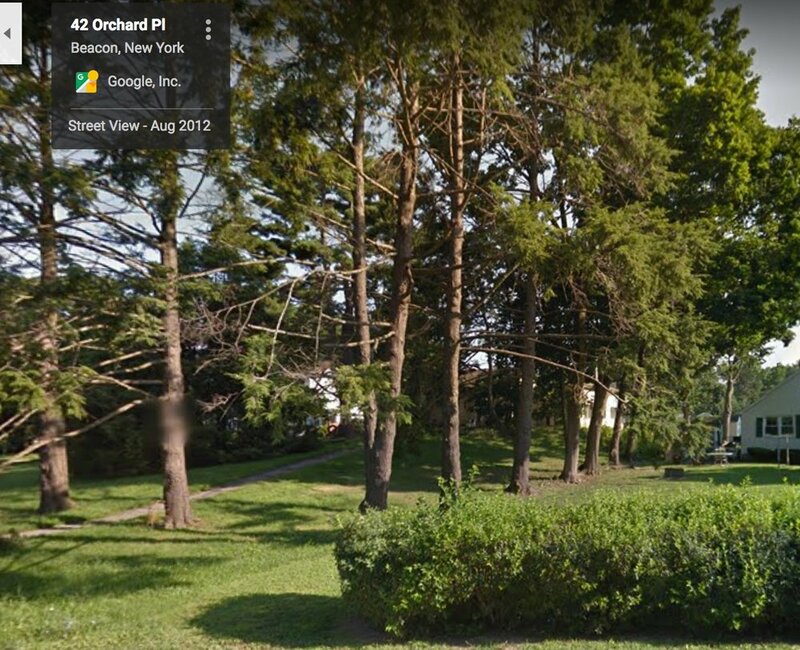 Google Maps photo of 51 Orchard Place, screenshot on 12/8/2017, after the trees were cut, but before Google updated their photo inventory. Regardless, there are laws that homeowners must follow. Unless you are living in the Wild West on dusty land in a log cabin you built yourself, with trees you cut down yourself, surrounded by nothing but distant mountains and rolling weedy meadows, sometimes there are rules one must follow in one's city. Rules are more obvious when they are delivered from an apartment complex manager, or condo community homeowners association. When it's individual homes on acres of land, the rules can be little harder to anticipate, since it feels like land that you own, where you should be able to do what you want. To get clarification for this article on which ordinance the mayor was referring to, A Little Beacon Blog emailed the mayor's office to find out exactly which ordinance this is, but did not get a reply by the time this article published. There are sections of the code that refer to trees, but we want to link you to exactly the right one, as provided by a city official. We also emailed the Building Department for a report on the current status of their actions, as alluded to by the Mayor, but also did not receive a reply before publication. December's Second Saturday is the sparkliest! With the tree lighting this weekend, the art galleries are alive and lit, several loaded with art gifts and small works. 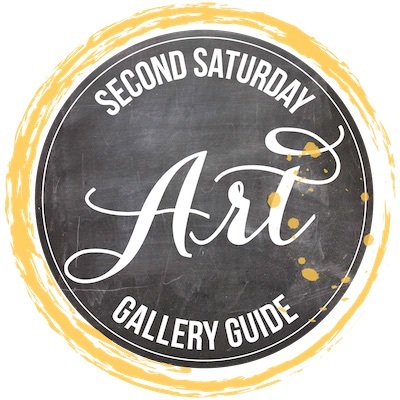 Find them in our Second Saturday Guide! 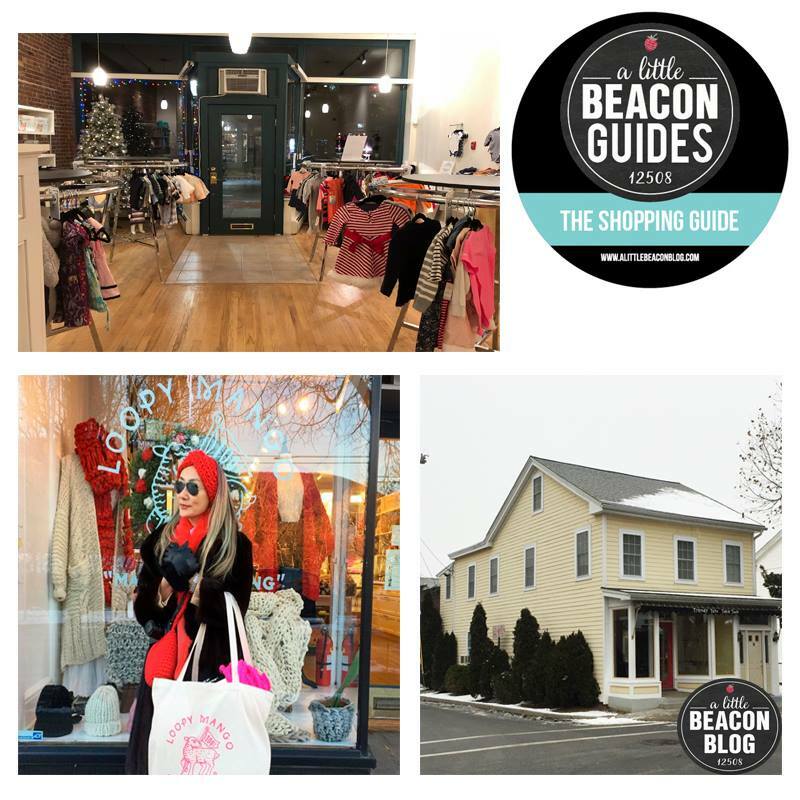 This is the time to find the most special things of the season, and Beacon is filled with fantastic options. Anything you want, you'll find it here. All you need to do is walk around and step inside. And now... for the weekend's Things To Do! 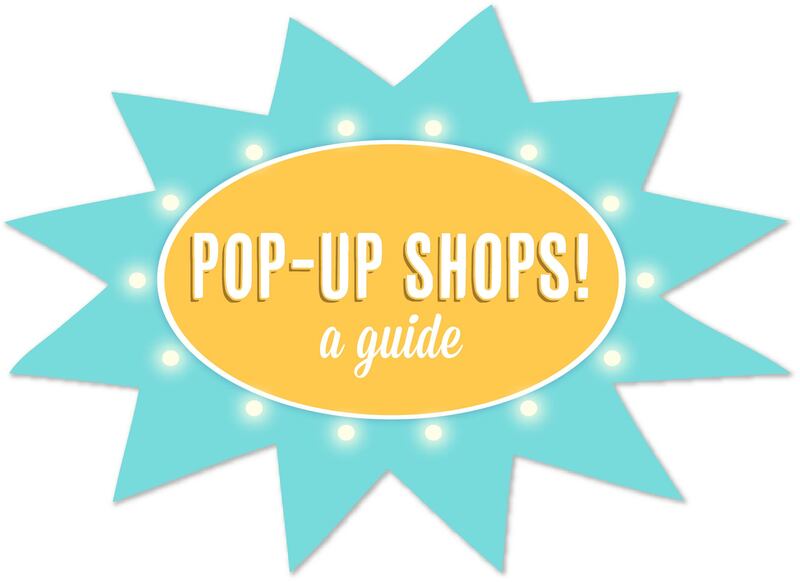 If you are hosting a true pop-up shop - a limited-time-only shopping event that is more than a trunk show - then you can submit it to A Little Beacon Blog's Pop-Up Shop Guide with flyer. Pop-ups are fun! 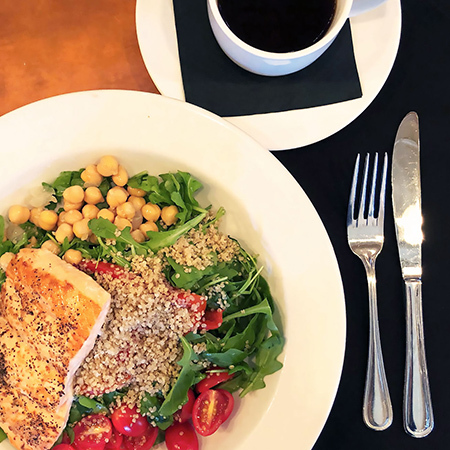 Check out this healthy and delicious brunch salad - grilled Scottish salmon with quinoa, arugula, grape tomatoes, chickpeas, roasted peppers and a lemon vinaigrette. Pinkies out for the clinking coffee cup toast! Where is The Vault? Near Beacon Bath & Bubble. Bellus has #allthegifts! 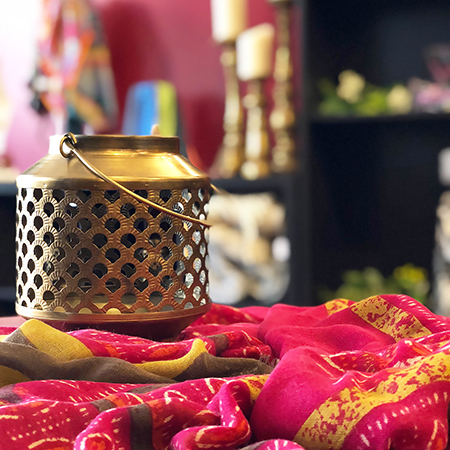 And everything in the shop is 40% off, including this festive silk scarf and beautiful vintage-inspired brass lantern candleholder (may as well pick up a pair, while they're 40% off). Decor treasures are waiting to be found in Bellus, so pick up a gift or treat for your home this weekend. 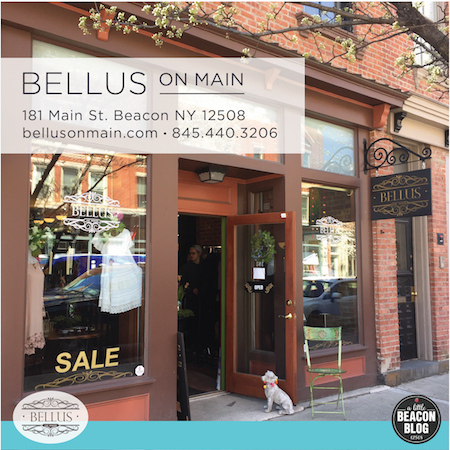 Where is Bellus on Main? Next door to Luxe Optique. Shopping for glasses at Luxe Optique is half the fun of finding your favorite pair. And the rumors are true - you'll find a favorite pair, and then you'll find another, and another. It's ok - break free from the mold of glasses, and treat these accessories as you would jewelry or shoes! Give the gift of selection, and liberate your loved one with a gift certificate. You can never go wrong with a gift card! 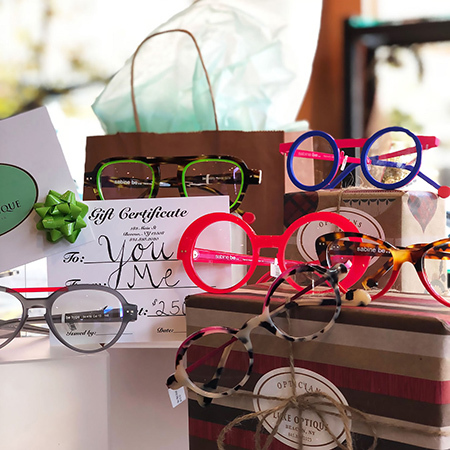 Luxe Optique has them available for your gift-giving needs. There's no such thing as having too many scarves. 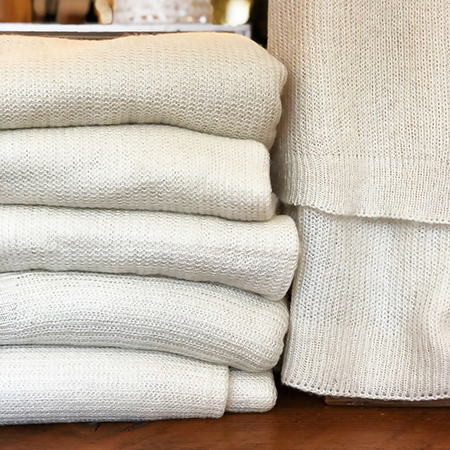 Especially when they're as cozy and soft and versatile and gigantic (46 inches wide by 100 inches long) (that's about 4 feet by 8 feet, folks) as this waffle knit one by Free People. Yes, the Scarf Blanket is back and it's a style you want to wrap yourself in. Available in ivory and black. Get both. This Lillian West gown is extra special because it's both a mini-gown and a full gown. 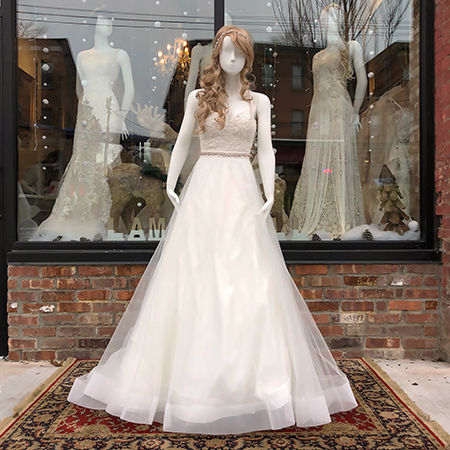 The full ballgown skirt has tiers of chiffon and a cathedral-length train, which can be removed to reveal a minigown featuring a halter neckline, all-over lace, and crisscross lace-up back. Get married in the gown, then dance in the mini! Where is Lambs Hill? In the renovated factory building near the dummy light. The easiest and most loved gift certificates are those to meet beauty needs! 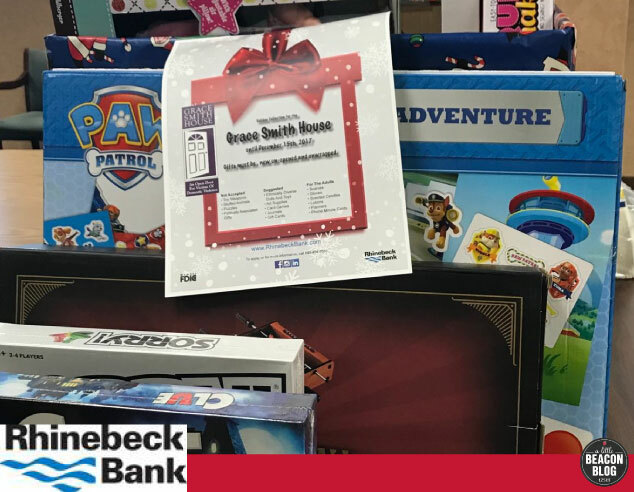 Rhinebeck Bank is collecting new toys for Grace Smith House's annual toy drive, benefiting kids who stay with them during times of safety and transition. See here for more information on how you can donate. 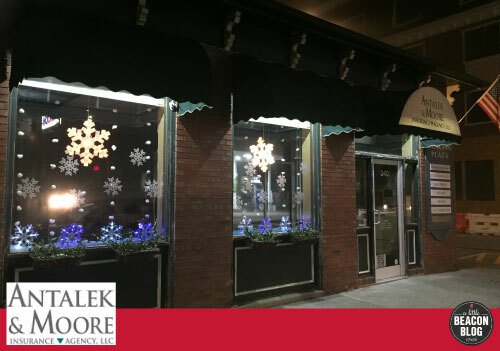 Happy Holidays from Antalek & Moore! The agency's windows are decorated brightly as they are every year. Take a picture with them when you're out, and don't forget to tag their Instagram! The Beacon Chamber of Commerce has a jam-packed evening of celebration and excitement coming up! 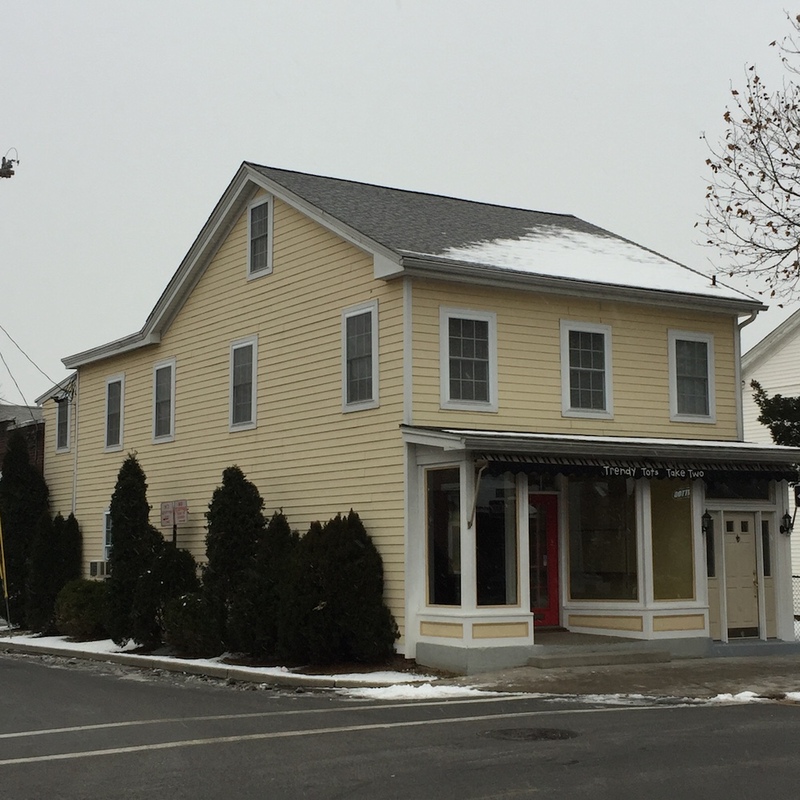 Next Wednesday, at 4 pm, there will be a ribbon-cutting to celebrate the 25th anniversary of Beacon Creamery and Kringles' Christmas Shop at 134 Main Street. Also, Kringles has opened for the season, so pick out some new Christmas-themed decor and gifts! After the ribbon-cutting, walk across the street to Chill Wine Bar (173 Main Street) for the Chamber's December Member Meeting and holiday get-together. Become a member of the Chamber online here. The annual lighting of the bicycles is this Saturday! The City of Beacon + BeaconArts Annual Bicycle Tree Lighting is Second Saturday, December 9. The Illumin8 2017: BHA + BeaconArts Bicycle Menorah will be lighted beginning December 12, lasting for 8 nights. One of the best ways to make sure these luminous traditions continue is by making a donation to BeaconArts, which you can do right here online. Need a last-minute holiday event location? A Little Beacon Space has the tree up! To book your private event, see here for pictures and details. Part of our mission is empowering business owners to take their websites and social media into their own hands. To do that, you just need a little visual inspiration, some systems, and the gumption to promote what you've got. Contact us today to set up Private Training Sessions to get you on your way. 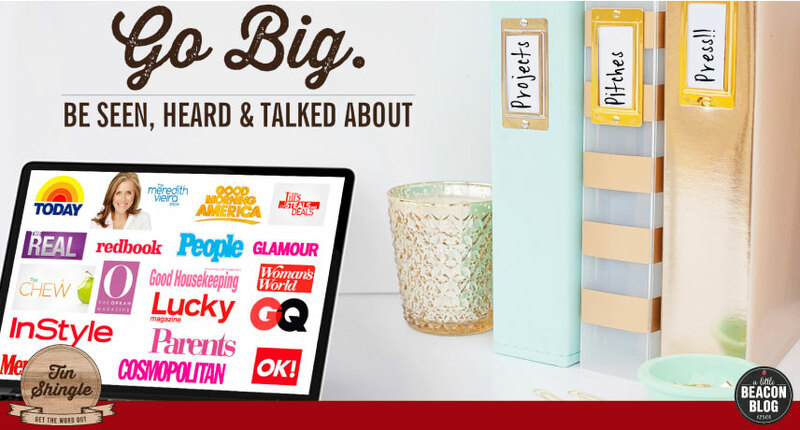 Want to know how all of those products you see in magazines make their way into Gift Guides you use to find gift ideas? See how Sh*t That I Knit used Tin Shingle to get into InStyle's Holiday Gift Guide. Your business can do this too! We know what you're thinking: "I want my business featured here!"